Join other teens, ages 12-18, on the fourth Monday of every month to snack, chat and discuss a variety of titles for teens (or of teen interest). Haven't yet read this month's book? Stop by the Youth Desk to borrow a copy. The Never Too Old YA Book Club meets at 8 p.m. to discuss Speak by Laurie Halse Anderson. Join our very own bookseller Robin in a livley discussion of The Impossible Knife of Memory by Laurie Halse Anderson. Irreverents, intellectuals and instigators welcome. In this psychologically suspenseful novel, Laurie Halse Anderson's (Speak) 17-year-old heroine bravely copes in a household where her father battles PTSD and addiction.Homeschooled for the past five years, Hayley Kincain enters public high school as a senior. Her observations reflect the teen's finely honed skills at reading her surroundings. "High school is where the zombification process becomes deadly," she thinks, after 24 days at Belmont. Hayley is sent to detention after attempting to correct her history teacher, and winds up in the guidance counselor's office because they can't get hold of Hayley's father--who's jobless again. After his two tours in Iraq and two in Afghanistan, Hayley watches the "superhero who made the world safe" slowly self-destruct.Anderson reveals Hayley's father's fragile emotional state little by little. Brief italicized chapters intermittently interject his memories around Hayley's first-person narrative. These add substance to the teen's insights into her father and dimension to her experience of him. Hayley becomes attracted to smart, persistent classmate Finn and comes to understand how much effort it takes to make a relationship work. Anderson delicately balances the slow-building optimism that arises from Hayley and Finn's evolution through the course of the book with weightier themes of neglect and abandonment resulting from the addicts in their lives (Finn's sister also battles addiction). The author creates a parallel between a parent and child both attempting to shut out the past in order to move forward, and characters authentic enough to pull off the build-up to her climactic denouement. Laurie Halse Anderson -- "The Impossible Knife of Memory"
Laurie Halse Anderson will Speak about and sign her new book, The Impossible Knife of Memory, on Saturday, January 11th at *4:00pm*. About the book: For five years, Hayley and her father, Andy, have been on the road as he struggles to escape the demons that have tortured him since his return from Iraq. Now they are back in the town where he grew up. Perhaps Hayley can have a normal life, put aside her own painful memories, even have a relationship with Finn. Will being back home help Andy’s PTSD, or will his memories drag him to the edge of hell? The Impossible Knife of Memory is Laurie Halse Anderson at her finest: compelling, surprising, and impossible to put down. This is a FREE teen event, open to everyone! Be a part of this wonderful outreach as readers all across the country spread the joy of reading by giving away half a million free books. Givers across the USA will spend the evening handing out free books to their selected recipients in non-traditional locations, with a focus on books for low and non-readers. With books like The Hunger Games, Wintergirls, Little Bee, Ender’s Game, The Kite Runner, A Prayer for Owen Meany, The Stand and many more, lucky recipients will not be disappointed. Givers are invited to join us at Mysterious Galaxy for our World Book Night wrap-up and Reflection Mixer on Monday April 30th. On the day of WBN April 23rd we will have reliable staff available to answer any questions you might have about distribution. Venue: Left Bank Books - Downtown | Her freshman year at Merryweather High, Melinda is friendless, outcast, because she busted an end-of-summer party by calling the cops. She practically stops talking altogether, but through her work on an art project, she is finally able to face what really happened at that terrible party: she was raped by an upperclassman. This utterly believable heroine Speaks for many a disenfranchised teenager while demonstrating the importance of Speaking up for oneself. Laurie Halse Anderson reads from Forge. 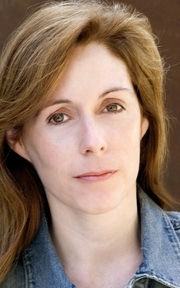 Laurie Halse Anderson is a LibraryThing Author, an author who lists their personal library on LibraryThing. Laurie Halse Anderson is currently considered a "single author." If one or more works are by a distinct, homonymous authors, go ahead and split the author. Laurie Halse Anderson is composed of 9 names. You can examine and separate out names.